We met one of our Boat Sharers, Chris Sutton, at the London Boat Show 2015. He kindly agreed to give us a few minutes to talk about his own share scheme based in Spain, how it started and why it’s become such a passion. What has been your background and experience in boating? I have enjoyed boating and the water for many years, starting with a spell working with the team of the 1989 Whitbread Round The World yacht “Creightons Naturally”, an eighty foot sailing yacht under the watchful eye of John Crittenden – a lovely guy, and then on to some time with Pete Goss on “Aqua Quorum”, an engine-less fifty foot yacht that was little more than a surf-board with a sail that participated in the Vende Globe Single-Handed Round the World Yacht Race – Pete was an outstanding mentor and an inspiration with it. Having spent some time on the water and supplied life-saving satellite communications equipment to numerous yachtsmen (including Tony Bullimore), I thought it appropriate to spend some of the hard-earned money on the acquisition of a yacht for myself. My wife suffers from ME (a perpetual condition of fatigue), so investing in a sailing yacht was never really on the agenda for all the obvious reasons, which led me to motor – so I have been involved in yachts for years, either enjoying the experience at the expense of others or in more recent years from my own purse. How did you come to the decision that boat sharing was something that would suit you? When cash allowed, I entertained my family with overseas holidays and was usually drawn to areas where there was either a marina or harbour. Quite often after our evening meal, we all walked along the front gazing at the yachts and admiring the folks for their achievement. I would think - one day! That day arrived and we owned our first yacht, and once bitten by the Maribug, you just cannot leave the water alone thereafter. So, having enjoyed some breaks-away on the yacht, which further improved my boat handling skills and general knowledge on the water, it occurred to me one evening whilst on deck at sunset that there were families wandering past and gazing at the yachts just as I had done years before. Recognising that I was looking at time-past, with people emulating just what I had done years before, my thoughts then turned to how we could get them involved in boating sooner?... the Maribug would do everything thereafter! It was then that I started thinking about ways I could share the boat with others, so I drafted a scheme and started to advertise and market the yacht under a share arrangement. I placed the Ad on Preloved and a couple of similar sites. No takers of real merit, until one kind soul suggested I look at Boatsharefinder – how civilised of them! I placed a similar advert on BSF and now we have folks showing a serious interest. It really works! If an option to buy a yacht by partner-shares had existed before, I would have done so, simply to get onto the water at a younger age – I am not old, but I could have been on the water in yacht ownership perhaps ten years or so earlier, and that my friends, is ten years more fun on the clock of life and experience. You will soon learn in life that you can lose money, but not lose time – money can be earned, but no one can give you lost-time back; time is priceless. Why did you choose your current boat? 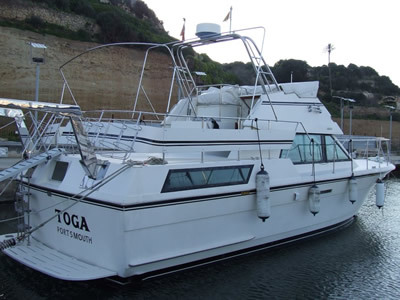 The yacht I now own is called Toga, a very sturdy American built motor yacht of 43 feet LOA at about 20 tonnes with all the comforts of home, literally. When she is under way, she glides through the water effortlessly and holds majestic poise when you enter the marina or harbour, and in many ways, she is easier to handle than a yacht of half her size. Oddly, the larger the yacht, the easier it is to master. Can you describe a little of how your boat share agreement/syndicate works? The advantages of a group mean you can share the benefits with others of new sailing locations, involve a wider audience with your own friends and family, and of course share the associated costs. The scheme clearly engages people who want the pleasures that can only be provided by yachting, but in normal circumstances cannot afford the cost alone. In my scheme, we have eight owner-partners each possessing eight shares, and they enjoy allotted time away each year on a revolving clock-face. So each member has one month of time split into two week segments. The balance of the time is spent either drying out or receiving annual maintenance which is covered by the scheme. One element that is often overlooked by single/sole boat owners is frequency of ‘use’ of the asset, and what I mean by this is basic TLC – boats need this too, not just people. 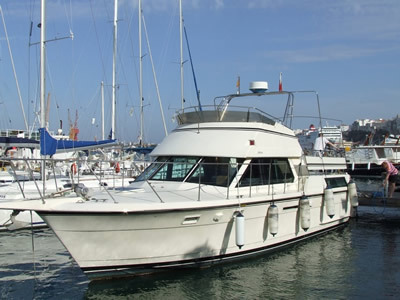 Under a shared ownership scheme, the yacht enjoys an almost weekly presence of people, if not by the marina staff in preparing the boat in readiness for the next partner-owner to take a segment of his/her allotted time on the water, but by the partner-owners themselves, so the boat is never idle for long and hence preserves the asset rather than eroding and devaluing it. Were there any fears you had going into the agreement and how have those played out once you got into the syndicate? We have not formed the full syndicate as yet (eight partner shareholders required), but are part way on the journey. Whilst I have pending fellow shareholders of the yacht on a register, I am still seeking additional partners and encourage those with little to no experience to come forward, as training is provided as part of the deal. Once the syndicate is complete, I will act as managing partner on behalf of the group, but anyone can take this role on once the full group has been established, as I will become an equal shareholder with everyone else. In the event you are a raw novice, by use and experience (following a period of on-the-yacht-training in the Med), you will soon become as good as any other part-time pleasure-yachtsman. As with most things in life, the more you do it, the better you become. I will add, that I have already rejected people for not being appropriate to the share-partner ideal I am trying to create, and it was more an absence of maturity than of yachting competence. My role in the early stages of assembling the share-partners is to ensure we have a cohesive group. It is not important that we ‘know’ each other, but it is important that we all hold lateral respect for our fellow partners. If you had to name one thing that makes your syndicate/agreement work for you, what would that be? Communication: Bi-annual meetings to ensure the group stay cohesive and act as one, good communication between the group, regular accounting and auditing. Ensuring the group practice the statement of ‘do unto others as you would have done unto you’, sounds Biblical perhaps, but it works. When you are on the boat, always ensure you leave the boat tidy, fuelled (we always carry a full tank – it is the easiest and fairest way to measure it for all, after use, just fill it up), and with the basics like tea & coffee replenished. Anyone now joining the yacht for their break can expect these minimum basics to be included so that you can settle immediately on arrival. What advice would you have for anyone who has just started considering boat sharing but needs more information? It would be considered a risk sharing your boat with a novice, right? Quite wrong, the contrary is true. It is a frequently presented argument that if you rent something, the asset is perhaps less likely to be cared for, whereas ownership – even in part – is more likely to increase the presence-of-mind and sharpen the focus. It is all too easy to take an asset like a yacht and become emotionally attached to it, many do (I did), but are they acting sensibly, or irrationally? I for one would argue strongly that if you follow your head, you might make a better decision than following your heart – share the asset, don’t rent it. For a more detailed description of my syndicate, please take a look at my listing on this site.